Seashore Farm Guesthouse provides Bed and Breakfast accommodation to a very high standard in a very spacious and magnificent setting at the head of the Ring of Kerry Peninsula with commanding Views overlooking Kenmare Bay with the Caha Mountains of the Beara Peninsula forming the backdrop to this unique location. 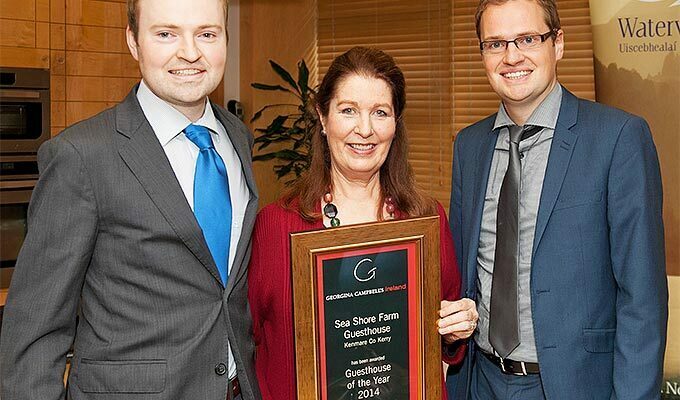 Seashore Farm Guesthouse is a Grade A 4 Star [Hotel Quality] Guesthouse as well as being AA 4 star with the special personal touch that only a small family run Guest House can deliver. 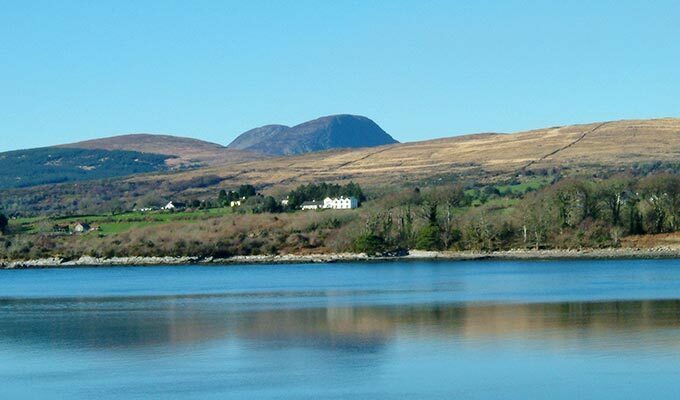 Yet Seashore Farm Guesthouse is just one mile from the centre of Kenmare Town. One can walk the mile via the quiet Tubbrid local side road [L7556] in ten to fifteen minutes. For those wishing to do the journey by car one can drive to the very convenient free town car park at the end of this road and freely stroll through the town centre without parking worries. 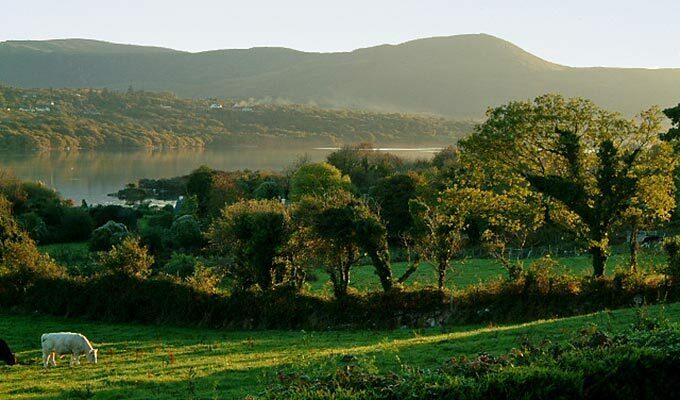 We are also situated just 400 metres from the main Ring of Kerry N70 Wild Atlantic Way road. 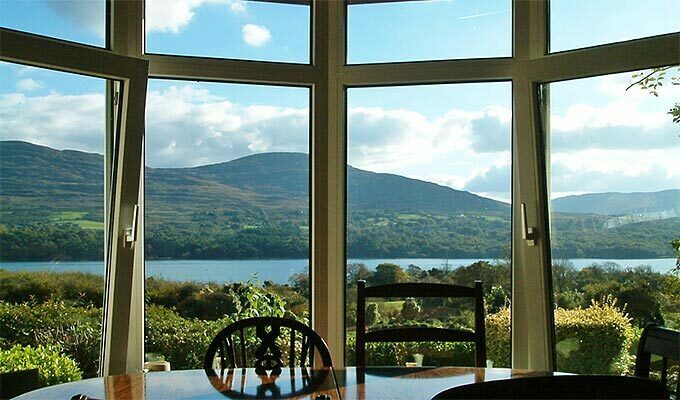 Seashore Farm Guesthouse is uniquely peaceful, private and spacious with views stretching out over the Kenmare Bay and Caha Mountains in the background. All bedrooms enjoy the idyllic setting over the bay as does the Guest Lounge, Guest Dining Room and Patio Area with extensive gardens. 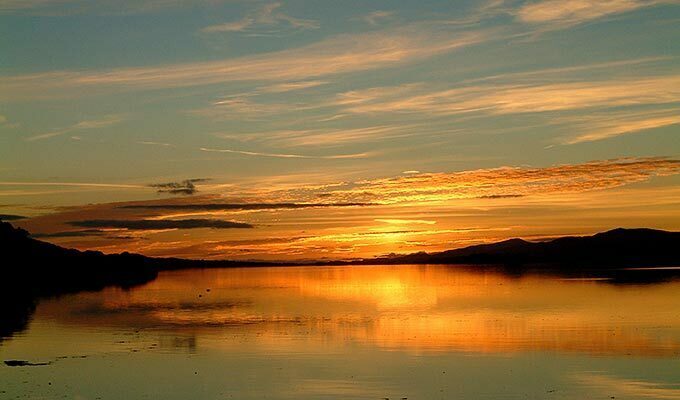 The farmlands stretch to the shores of Kenmare Bay affording unspoilt walks with plentiful birdlife and wildlife in natural habitat. 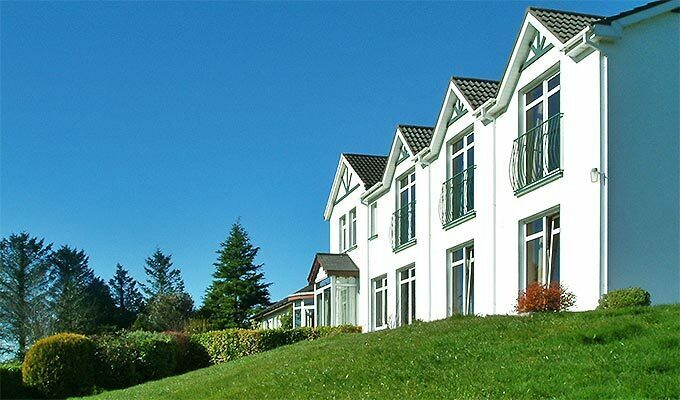 All Bedrooms are very spacious and enjoy the idyllic setting overlooking the Kenmare Bay. Each Room has either a King Size Bed or Twin Beds [2 single beds]. All have En-Suite Spacious Bathrooms with Power Showers and some also have Jacuzzi baths as well. 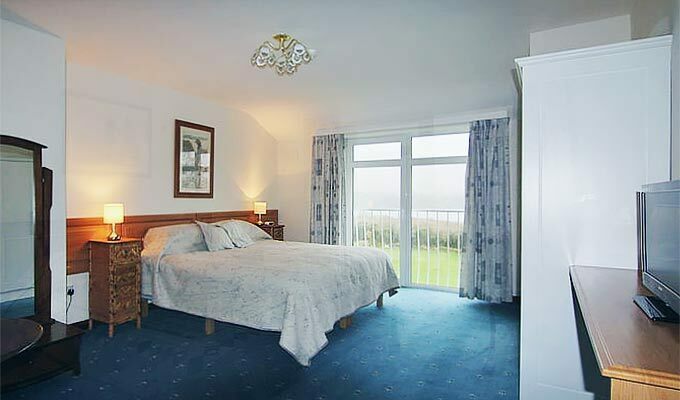 Rooms have tea/coffee facilities, hairdryers and are well furnished for relaxation. There is an extensive library of fine books, local and national travel literature and maps for guests to use and enjoy. There is extensive, secure private parking for Guest Use. We came in very late and thus where warmly welcomed. The hosts of Seashore Farm Guesthouse run their B&B passionately and loving. It feels a bit like visiting family after a long time. Breakfast is superbe, the rooms are large and very clean. The views from the terraces are grand. Thank you for accommodating us! This is a amazing B&B. Everything is perfect 200%. Room, scenery view, breakfast, quitness, Perfect ! A lovely B&B just outside the village of Kenmare. Quiet and idyllic, and just what we wanted for our stay. Our hosts were wonderfully welcoming and generous in suggestions about what to do and see during our stay, with lots of reference material on a wide range of topics available. Our ensuite bedroom was quiet, clean and comfortable.